Work pervades the Gospel of John. It starts with the work of the Messiah, who is God’s agent of the creation of the world. Christ’s work of creation pre-dates the Fall, pre-dates his incarnation in the form of Jesus of Nazareth, and pre-dates his work of redemption. He is sent by God to be the redeemer of the world precisely because he is already the co-creator of the world. His work of redemption is not a novel course of action, but a restoration of the world to the path it was always intended to take. It is a fulfillment of the creation’s promise. Human labor is an integral part of the fulfillment of creation (Genesis 2:5). But the work humans do has become corrupted, so the redemption of work is an integral part of the Messiah’s redemption of the world. During his earthly ministry, we will see that the work Jesus does for the Father is an integral aspect of Father and Son’s love for each other. “The words that I say to you I do not speak on my own; but the Father who dwells in me does his works” (John 14:10). This provides the model for redeemed human labor, which is likewise meant to nurture our love for one another as we work together in God’s good world. In addition to modeling good work, Jesus teaches about workplace topics such as calling, relationships, creativity and productivity, ethics, truth and deception, leadership, service, sacrifice and suffering, and the dignity of labor. One of John’s chief interests is to remind people that a casual glance at Jesus will never do. Those who remain with him find his simple images opening up into an entirely new way of looking at the world. This is as true of work as it is of anything else. The Greek word for “work” (ergon) appears over twenty-five times in the Gospel, while the more general term for “doing”(poieō) occurs over one hundred times. In most cases, the words refer to Jesus’ work for the Father; but even this, it turns out, will hold promise for ordinary human employment. The key to making sense of this material is that it takes work to work out what the Gospel of John means. The meaning often lies deeper than a casual reading can uncover. Therefore, we will delve into a limited number of passages with particular meaning for work, workers, and workplaces. We will pass over passages that do not contribute essentially to our topic. “In the beginning was the Word, and the Word was with God, and the Word was God. He was with God in the beginning. Through him all things were made; without him nothing was made that has been made.” (John 1:1) The majestic opening of John’s Gospel shows us the limitless scope of the Word’s work. He is the definitive self-expression of God, the one through whom God created all things in the beginning. He stretches out the cosmos as the canvas for the expression of God’s glory. The Word is working; and because his work began in the beginning, all subsequent human labor is derived from his initial labor. Derived is not too strong a word, because everything people work with was created by him. The work God did in Genesis 1 and 2 was performed by the Word. This may seem too fine a point to press, but many Christians continue to labor under the delusion that the Messiah only began working once things had gone irredeemably wrong, and that his work is restricted to saving (invisible) souls to bring them to (immaterial) heaven. Once we recognize that the Messiah was working materially with God from the beginning, we can reject every creation-denying (and thus work-denigrating) theology. Therefore we need to correct a common misunderstanding. John’s Gospel is not grounded in a dichotomy of the spiritual versus the material, or the sacred versus the spiritual, or any other dualism. It does not portray salvation as the liberation of the human spirit from the shackles of the material body. Dualistic philosophies such as these are regrettably common among Christians. Their proponents have often turned to the language of the Gospel of John to support their views. It is true that John frequently records Jesus’ use of contrasts such as light/darkness (John 1:5; 3:19; 8:12; 11:9-10; 12:35-36), belief/unbelief (John 3:12-18; 4:46-54; 5:46-47; 10:25-30; 12:37-43; 14:10-11; 20:24-39) and spirit/flesh (John 3:6-7). These contrasts highlight the conflict between God’s ways and the ways of evil. But they do not constitute a division of the universe into dual sub-universes. They certainly do not call Jesus’ followers to abandon some sort of “secular” world in order to enter a “spiritual” one. Instead, Jesus employs the contrasts to call his followers to receive and use the power of God’s spirit in the present world. Jesus states this directly in John 3:17, “God did not send the Son into the world to condemn the world, but in order that the world might be saved through him.” Jesus came to restore the world to the way God intended it to be, not to lead an exodus out of the world. If further evidence for God’s ongoing commitment to the creation is needed, we may turn to John 1:14, “The Word became flesh and lived among us.” The incarnation is not the triumph of the spirit over the flesh, but the fulfillment of what the flesh was created for in the beginning. And the flesh is not a temporary base of operations, but the Word’s permanent abode. After his resurrection, Jesus invites Thomas and the others to touch his flesh (John 20:24-31) and later has a breakfast of fish with them (John 21:1-15). At the end of the Gospel, Jesus tells his disciples to wait “until I return” (John 21:22-23, NIV), not “until I get us all out of here.” A God hostile to, or uninterested in, the material realm would hardly be inclined to take up permanent residence within it. If the world in general is of such immense concern to God, it stands to reason that the work done within that world matters to him as well. We will return to the conventional term “disciples” momentarily, but the term “friends” captures the essence of John’s depiction of the disciples. “I have called you friends,” says Jesus (John 15:15). The relational element is critical: they are Jesus’ friends who first and foremost remain in the presence of Jesus (John 1:35-39; 11:54; 15:4-11) John appears to go out of his way to crowd as many people as possible on stage with Jesus in chapter 1 . John the Baptist points Jesus out to Andrew and another disciple. Andrew gets his brother Simon. Philip, who is from the same town as Andrew and Simon, finds Nathanael. It is not simply that Jesus will advance his mission through a web of interpersonal relationships. Weaving a web of relationships is the point of the whole enterprise. But the disciples are not just buddies basking in the radiance of Jesus’ friendship. They are also his workers. They are not working in an obvious way yet in chapter 1 (though even the fetching of siblings and neighbors is a type of evangelistic labor), but work they will. Indeed, as we will see, it is precisely this connection between friendship and labor that holds the key to John’s theology of work. Work produces results while it also builds relationships, and this is another echo of Genesis 2:18-22. Jesus’ “first sign” (John 2:11), changing water into wine at a wedding in Cana, lays the foundation for understanding the subsequent signs. This is no parlor trick done to attract attention to himself. He does it reluctantly, and the miracle is hidden even from the master of the banquet. Jesus does it only in the face of pressing human need and to honor his mother’s request. (Running out of wine at the wedding would have brought great shame on the bride, the groom, and their families, and that shame would have lingered long in the village culture of Cana.) Far from being an unmoved mover (as some Greeks regarded God), Jesus shows himself to be the loving, responsive Son of the loving, eternal Father and the beloved human mother. The fact that he turns the water to wine shows that he is like the Father not only in love, but also in his power over the creation. Attentive readers of John should not be surprised that the Word who made all things, now made flesh himself, is able to bring material blessings to his people. To deny that Jesus can work miracles would be to deny that Christ was with God in the beginning. What is most surprising, perhaps, is that this apparently unplanned miracle ends up pointing unmistakably to Jesus’ ultimate purpose. He has come to draw people to God’s consummate wedding feast, where they will joyfully dine with him together. Jesus’ mighty works, done with the stuff of the present world order, are amazing blessings in the here and now; and they also point to still greater blessings in the world to come. Jesus’ discussions with Nicodemus and his disciples hold innumerable treasures. We will begin with a verse that has profound implications for human labor. “The Father loves the Son, and has placed all things in his hands” (John 3:35). While the immediate context emphasizes the fact that the Son speaks the Father’s words, the remainder of the Gospel makes it clear that “all things” really does mean “all things.” God has authorized his Messiah to create all things, God sustains all things through him, and God will bring all things to their appointed goal through him. This passage reiterates what we learned in the prologue: the Father involves the Son in the founding and sustaining of the world. What is new is the revelation of why the Father chose to include the Son, rather than simply creating by himself. It was an act of love. The Father shows his love for the Son by placing all things in his hands, beginning with the act of creation. The world is a “labor of love” in the fullest sense of the word. Work must be something more wonderful than we usually give it credit for, if adding to someone’s workload is an act of love. We will develop this all important idea further as we see Jesus in action throughout the remainder of the Gospel. But chapter three does more than reiterate how the Word took on human flesh. It also illustrates the inverse process, how human flesh can become filled with God’s spirit. “Very truly, I tell you, no one can enter the kingdom of God without being born of water and Spirit (John 3:5). We receive God’s Spirit (“enter his kingdom”) through a form of birth. Birth is a process that occurs in the flesh. When we become truly spiritual, we do not slough off the flesh and enter some immaterial state. Instead, we are more perfectly born — born “from above” (John 3:3) — into a state of union of Spirit and flesh, like Jesus himself. For example, consider a man heading a business in mission in Africa that builds boats for use on Lake Victoria. He says he is frequently approached by local officials who want him to pay a bribe. The request is always made in secret. It is not a documented, open payment, as is a tip or an expediting fee for faster service. There are no receipts and the transaction is not recorded anywhere. He has used John 3:20-21 as an inspiration to draw these requests into the light. He will say to the official requesting the bribe, “I don’t know much about these kinds of payments. I would like to bring in the ambassador, or the management, to get this documented.” He has found this to be a helpful strategy to dealing with bribery. It is important to understand that the metaphor of walking in the light is not a one-size-fits-all rule. Confidentiality and secrecy can have a proper place in work, as in personnel matters, online privacy or trade secrets. But even if we deal with information that should not be made public, we seldom need to act in complete darkness. If we are hiding our actions from others in our departments or from people with a legitimate interest, or if we would be ashamed to see them reported in the news, then we may have a good indication that we are acting unethically. The story of the woman at the well (John 4:1-40) has as much direct discussion of human labor as any story in John; but one has to draw deeply to taste it all. Many Christians are familiar with the woman’s inability to move from the everyday work of drawing water to Jesus’ pronouncements on the life-giving power of his word. This motif permeates the Gospel: the crowds repeatedly show an inability to transcend everyday concerns and address the spiritual aspects of life. They do not see how Jesus can offer them his body as bread (John 6:51-61). They think they know where he is from (Nazareth, John 1:45), but they fail to see where he is really from (heaven); and they are equally ignorant as to where he is going (John 14:1-6). All of this is certainly relevant for thinking about work. Whatever we think of the intrinsic good of a steady water supply (and every drink we take confirms that it is indeed a good thing! ), this story surely tells us that physical water alone cannot confer on us eternal life. In addition, it is easy for modern Westerners to miss the drudgery of the woman’s daily water chores, and ascribe her reluctance to fetch the water to sheer laziness. But the curse on labor (Genesis 3:14-19) bites hard, and she can be forgiven for wanting a more efficient delivery system. We should not conclude, however, that Jesus comes to free us from work in the grimy material world so that we can bathe in the sublime waters of spiritual serenity. We must first, as always, remember the comprehensive nature of Christ’s work as depicted in John 1: the Messiah made the water in the well, and he made it good. If he then uses that water to illustrate the dynamics of the Spirit’s work in the hearts of would-be worshippers, that could be seen as an ennoblement of the water rather than a downgrading of it. The fact that we reckon first with the Creator, then with the creation, is no slight on the creation, especially since one function of creation is to point us toward the Creator. “Do you not say, 'Four months more and then the harvest'? But I tell you, look around you, and see how the fields are ripe for harvesting. The reaper is already receiving wages, and is gathering fruit for eternal life, so that the sower and the reaper may rejoice together” (John 4:35-36). In addition to providing the palpable blessings of the daily bread for which we are instructed to pray, agricultural work can also serve as a way of understanding the advance of God’s kingdom. More than that, Jesus directly dignifies labor in this passage. We first have the statement, “My food is to do the will of him who sent me and to complete his work [Gk., ergon]” (John 4:34). It is worth noting that the first appearance of the Greek word ergon in the Bible shows up in Genesis 2:2. “On the seventh day God had finished the work [Gk., “his works,” erga] that he had done, and he rested on the seventh day from all the work that he had done [again, “his works,” erga in Gk. ].” While we cannot be certain that Jesus is alluding to this verse in Genesis, it makes sense in light of the rest of the Gospel to take “God’s work” in John 4:34 to mean the comprehensive restoration or completion of the work God had done in the beginning. There is something more subtle at work here as well. In John 4:38, Jesus makes the somewhat cryptic statement, “I sent you to reap for that which you did not labor. Others have labored, and you have entered into their labor.” He is referring to the fact that the disciples have a field of Samaritans ripe for the kingdom, if they will only open their eyes to the opportunity. But who are the “others” who have done the “labor”? Part of the answer seems to be, surprisingly, the woman at the well, who is remembered more for her spiritual slowness than for her subsequent effective testimony for Jesus. “Many of the Samaritans from that town believed in him because of the woman's testimony, ‘He told me everything I ever did’” (John 4:39). The disciples will simply be reaping where the woman has sown. Yet there is still another worker here: Christ himself. Back at the beginning of the story, we read that Jesus was “tired” from his journey. A more literal translation would be that Jesus was “labored” from his journey. The word translated “tired” is kekopiakōs, literally “labored.” This is the same root that appears in John 4:38 (and nowhere else in John’s Gospel), “…you did not labor [kekopiakate]…others have labored [kekopiakasin]…you have entered into their labor [kopon]…” In truth, Jesus was labored from his journey in Samaria. The field of Samaria is ripe for harvest in part because Christ has labored there. Whatever work we do as Christ’s followers is filled with the glory of God, because Christ has already worked the same fields to prepare them for us. As we have seen, the redemptive work of Christ after the Fall is of a kind with his creative/productive work from the beginning of time. Likewise, the redemptive work of his followers is in the same sphere as their creative/productive work typified by homemakers drawing water and farmers reaping crops. Evangelism is one of the many forms of human work, neither higher nor lower than homemaking or farming. It is a distinctive form of work, and nothing else can substitute for it. The same may be said of drawing water and harvesting grain. Evangelism does not displace creative/productive work to become the only truly worthy human activity, particularly since any work well done by Christians is a testimony to the renewing power of the Creator. That is, in the Septuagint, the ancient Greek translation of the Hebrew Bible. The healing of the man at the pool of Bethsaida brings to the surface a controversy familiar from Matthew, Mark, and Luke: Jesus’ penchant for healing on the Sabbath. If the controversy is familiar, however, Jesus’ self-defense takes a slightly different angle. His lengthy argument is crisply summarized in John 5:17, “My Father is still working, and I also am working.” The principle is clear. God keeps the creation going even on the Sabbath, and therefore Jesus, who shares the divine identity, is permitted to do the same. Jesus was almost certainly not alone in arguing that God was at work on the Sabbath, but his deduction about justifying his own work is unique. As a result, we cannot use this story to deduce the propriety or impropriety of our working on the Sabbath. We may be doing God’s work, but we do not share the divine identity as Christ does. Human work having life-or-death consequences—military self-defense (1 Maccabees 2:41) or pulling an animal from a ditch—was already accepted as legitimate on the Sabbath. The healing itself is not questioned in this episode, even though the man would have suffered no harm had Jesus waited until Sunday to heal him. Instead, Jesus is criticized for permitting him to carry a mat—a form of work, according to the Jewish Law—on the Sabbath. Does this imply that Jesus permits us to drive to vacation on the Sabbath? Fly on Sunday to a business meeting that begins on Monday morning? Operate a continuous casting plant 24/7/365? There is no hint here that Jesus is merely widening the list of activities permitted on the Sabbath. Instead, let us apply the theme we see running through John—work that maintains and redeems the creation (material or spiritual) and contributes to closer relationships with God and people is appropriate for the Sabbath. Whether any particular work fulfills this description must be discerned by the person(s) involved. For more on this topic, see "Matthew 12:1-8" in Matthew and Work, "Mark 1:21-45" and "Mark 2:23-3:6" in Mark and Work, and "Luke 6:1-11; 13:10-17" in Luke and Work and the article Rest and Work at www.theologyofwork.org. A clearer, and more important, lesson for us from this narrative is that God is still at work to maintain the present creation, and Jesus furthers that work in his healing ministry. Jesus’ signs are at one level the in-breaking of the new world. They demonstrate “the powers of the age to come” (Hebrews 6:5). At the same time, they are also the up-keeping of the present world. It seems perfectly appropriate to see this as a paradigm for our own myriad jobs. As we act in faith to restore what has been broken (as doctors, nurses, auto mechanics, and so forth), we call people to remember the goodness of the creator God. As we act in faith to develop the capacities of the creation (as programmers, teachers, artists, and so on), we call people to reflect on the goodness of humanity’s God-given dominion over the world. The work of redemption and the work of creation/production, done in faith, both shout out our trust in the God who is, and who was, and who is to come. God created all things through Christ, is restoring them to his original intent through Christ, and will bring them to their appointed goal through Christ. "Do not work for food that perishes, but for food that endures for eternal life, which the Son of Man will give you. For it is on him that God the Father has set his seal." Then they said to him, "What must we do to perform the works of God?" Jesus answered them, "This is the work of God, that you believe in him whom he has sent." A quick reading reveals at least two major issues: first, Jesus appears to issue a direct command not to work; and second, he appears to reduce even work for God to belief. The first issue is a matter of context. All Scripture, like all communication, must be seen in context. The issue in John 6 is that people want to keep Jesus around to serve as a Magical Baker King, who will keep the loaves coming. Thus when Jesus says, “You are looking for me not because you saw signs, but because you ate your fill of the loaves” (John 6:26), he is rebuking their spiritual shortsightedness. They ate the bread, but they were unable to see what this sign signified. One way to understand what Jesus says next is to recognize it as the same lesson we learned in chapter 4 . Eternal life comes not from an unending supply of food, but from the living Word who proceeds from the mouth of God. Jesus ceases the preliminary work (serving loaves) when it no longer results in the desired end product (relationship with God). Any competent worker would do the same. If adding more salt ceases to make the soup taste better, a decent cook stops adding salt. Jesus doesn’t mean “stop working,” but stop working for more stuff (food) when more stuff isn’t what you need. This may sound too obvious to need the Word of God to tell us, but who among us doesn’t need to hear that truth again this very day? The apparent prohibition against working for temporal gain is a hyperbolic expression designed to focus on mending the crowd’s relationship to God. In addition we might ask the question, "What is the difference between food that perishes and food that endures for eternal life?" According to Jesus, food that perishes is food that merely fills you up. It satisfies the immediate need, but nothing more. As applied to the workplace, this could be working just for the paycheck, with no concern for the value of the work itself. By contrast, working for food that endures for eternal life, is analogous to work that accomplishes God’s purposes. As for the issue of God's purposes for work being reduced simply to belief, this must be seen against the backdrop of the rest of the Gospel and the theology of John’s letters. John delights in pushing things to extremes. On the one hand, his high view of God’s sovereignty and creative power leads him to exalt a humble dependence on God, as we see in this chapter. God’s work on our behalf is infinite—we need only to believe him and accept the work of God in Christ. On the other hand, Jesus is equally capable of laying the emphasis on our active obedience. “Whoever says, ‘I abide in him,’ ought to walk just as he did” (1 John 2:6), and again, “The love of God is this: that we obey his commandments” (1 John 5:3). We might join these two extremes with the Pauline expression, “the obedience of faith” (Romans 1:5), or James 2:18, “I by my works will show you my faith.” In other words, according to the Bible, belief is not mere intellectual assent, but includes faithful action. To believe in the one whom God has sent is not merely to agree that Jesus is the Son of God, but also to follow Jesus by doing the good work that God intends for us. This verse is especially interesting because the mud is in synonymous parallelism with dust, using the same Hebrew word for dust as in the creation of Adam in Genesis 2:7. For other associations of humanity and mud in the Bible, see e.g. Isaiah 29:16, 45:9; Jeremiah 18:6; Sirach 33:18; Romans 9:21; cf. Job 10:9, 33:6; outside the Bible, see e.g. Aristophanes, Birds 686; Herodes Odes 2.29. Jesus’ coming self-sacrifice would extract many forms of cost. It would cost him his death, of course, but also excruciating pain and thirst (John 19:28). It cost him the heartbreak of seeing his disciples (except John) desert him and his mother bereft of him (John 19:26-27). It cost him the shame of being misunderstood and wrongly blamed (John 18:19-24). These costs were unavoidable if he was to do the work God set before him. The world could not come into being without the work of Christ in the beginning. The world could not be restored to God’s intention without the work of Christ on the cross. Our work may also call for costs that are not fair to us, but which cannot be avoided if we are to complete our work. Jesus worked to bring true life to others. To the extent that we use our work as a forum for self-glorification, we depart from the pattern set for us by the Lord Jesus. Is Jesus acknowledging that work performed for others has an unavoidable cost? Perhaps so. Doctors earn a good salary from healing people (at least in the modern West) yet suffer an unavoidable burden of pain from witnessing their patients’ suffering. Plumbers get an enviable hourly rate, but also get covered with excrement from time to time. Elected officials work for justice and prosperity for their citizens, but like Jesus, bear the sorrow of knowing, “you always have the poor with you” (John 12:8). In each of these professions, there might be ways to avoid suffering alongside others—minimizing interaction with unsedated patients; plumbing only in new, unsoiled houses; or hardening our hearts to the most vulnerable people in society. Would doing so be following the pattern of Jesus? Although we often speak of work as how you make your living, any compassionate worker also experiences work as how you break your heart. In this way, we work like Jesus. R. Bauckham, God Crucified (Grand Rapids: Eerdmans, 1999), 68. Up to this point in John, we have seen Jesus doing work that no one else had ever done before — making water into wine, giving sight to the blind, raising the dead. Now he does what almost anyone can do, but what few want to. He washes feet. The king does the work of a slave. In doing so, Jesus brings to a head the question that has been following us the entire course of John’s Gospel—to what extent is Jesus’ work an example for our own work? It would be easy to answer, “Not at all.” None of us are the Lord. None of us die for the sins of the world. But when he washes the disciples’ feet, Jesus explicitly tells them — and by extension us — that we are to follow his example. “So if I, your Lord and Teacher, have washed your feet, you also ought to wash one another’s feet. For I have set you an example” (John 13:14-15). Jesus is an example we are meant to follow, so far as we are able. This attitude of humble service should accompany all we do. If the CEO walks the production floor, it should be as if coming to wash the assembly workers’ feet. So, too, the gas station attendant should clean the bathroom floors as if being there to wash the motorists’ feet. This is not so much a matter of action as attitude. Both the CEO and the gas station attendant can probably serve people better through other activities than washing feet, even if their employees or customers were willing. But they should see themselves as performing humble service. Jesus, the Spirit-filled teacher who reigns over the entire cosmos, deliberately performs a concrete act of lowly service to demonstrate what ought to be the habitual attitude of his people. By doing so, he both dignifies and demands from his followers humble acts of service. Why? Because doing so brings us tangibly face to face with the reality that godly work is performed for the benefit of others, not merely for the fulfillment of ourselves. The concept of servant leadership has received widespread attention in business and government in recent years. It arises not only in the Gospel of John but also in many parts of the Bible. See the article *Leadership (CONTENT NOT YET AVAILABLE) at www.theologyofwork.org for more. Other resources include Servant Leadership by Robert Greenleaf (Paulist Press, 1977) and Leadership is an Art by Max De Pree (Michigan State University Press, 1987). Chapters 13 through 17 , often called the Upper Room Discourse, contain so much profound theology that we can only touch on a few salient points. For our purposes, we are specifically interested in examining chapters 14 through 17. It is important to recognize that Jesus’ words are not a dispassionate lecture. He is in anguish for the disciples whom he loves, and whom he must soon leave and his words are designed above all to comfort them in their distress. An emphasis on personal relationships suffuses the theology of these chapters. Jesus calls the disciples “no longer servants…but friends” (John 15:15, NASB). They work for him, but in a spirit of friendship and collegiality. It is in the fullest sense of the term a family business. The work and the relationships intertwine, for Jesus is not working on his own. “The words that I say to you I do not speak on my own; but the Father who dwells in me does his works. Believe me that I am in the Father and the Father is in me” (John 14:10-11). Neither will the disciples be left as orphans to muddle through the world as best they can (John 14:18). Through the Spirit, Jesus will be with them, and they will do the same things he has been doing (John 14:12). This is deeper than it may appear. It does not mean merely that after Jesus dies, his disciple/friends can still experience him in prayer. It means that they are active participants in the world-creation/restoration that fuels the loving relationship between the Father and the Son. They do the work of the Son and Father, and they join the intimacy of the Son and Father (and the Spirit, as we shall see in a moment). The Father shows his love for the Son by allowing him to share in the glory of world formation and re-creation. The Son shows his love for the Father by ever and only doing his will, making and remaking the world for the Father’s glory according to the Father’s wishes in the power of the Spirit. The disciple/friends enter into this ever-flowing love of the Father, Son, and Spirit, not only by mystical reflection but also by embracing the Son’s mission and working as he did. The call to share in the love is inextricable from the call to share in the labor. The prayer, “I in them and you in me, that they may become completely one” (John 17:23), is matched by, “As you sent me into the world, I have sent them into the world” (John 17:18), and it issues forth in “Do you love me?...Feed my sheep” (John 21:17). An essential aspect of human labor is the opportunity it provides for fellowship through common projects. For many people, the workplace provides the most significant context outside family for personal relationships. Even those who work alone — inside or outside their own homes—are typically enmeshed in a web of relationships involving suppliers, customers, and so on. We have seen that Jesus calls his disciples not only as co-laborers but also as a community of friends. The relational aspect of work is not an accidental by-product of an essentially utilitarian enterprise of labor. Rather, it is an absolutely critical component of work itself, going back to the time when Adam and Eve worked together in the garden. “Then the LORD God said, ‘It is not good that the man should be alone; I will make him a helper as his partner,’” says the Lord God (Genesis 2:18). The creation becomes the means of interpersonal connection as humans work alongside one another, and in so doing enter into God’s labor to bring creation to its fulfillment. This can be a tremendous encouragement to project-oriented people who are sometimes made to feel unspiritual because of their reluctance to spend an abundance of time talking about their feelings. Talking with other people is a necessary activity for developing relationships, but we should not neglect the importance of doing work as a means for nurturing relationships. Working together can build relationships in and of itself. It is no accident that we spend a great deal of time working with and for other people. Modeled on God’s own work within the Trinity, we are able to find relationship in work. Work toward a common goal is one of the chief ways God brings us together and makes us truly human. Cf. John 3:35, 5:19-20. The statement in John 17:5, “So now, Father, glorify me in your presence with the glory that I had in your presence before the world existed,” may well refer specifically to the glory of sharing in world formation. This would form a fitting bookend to the inclusion of Christ in the primal creation in John 1:1-3. Expressed beautifully, for example, in Robert Frost’s “The Tuft of Flowers” with the memorable lines, “‘Men work together,’ I told him from the heart, ‘Whether they work together or apart.’” Robert Frost, A Boy’s Will (New York: Henry Holt, 1915), 49. 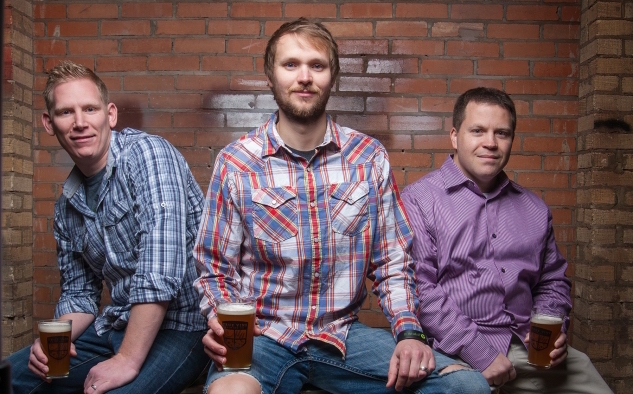 Ryan Dixon, Dan Griffith and Stephen Lee started True Vine, a micro brewery in Tyler, Texas. "'We're very tied with our family; so we didn't want something that was going to take us away from that,' Ryan said. Instead, the trio decided to open as a production brewery, selling their beer to local establishments. Read more about how they seek to live out their faith in their family and work lives here. The metaphor of vine and branches begins with the blessing of relationship with Jesus and through him with the Father (John 15:1). “As the father has loved me, so I have loved you; abide in my love” (John 15:9). Yet the outcome of this love is not passive bliss but productive labor, metaphorically expressed as bearing fruit. “Those who abide in me and I in them bear much fruit” (John 15:5). The God who produced the universe wants his people to be productive too. “My Father is glorified by this, that you bear much fruit” (John 15:8). Our ability to do work that makes a lasting difference in the world is a great gift from God. “I appointed you to go and bear fruit, fruit that will last, so that the Father will give you whatever you ask him in my name” (John 15:16). The promise of effectiveness echoes Jesus’ promise earlier, that “the one who believes in me will also do the works that I do and, in fact, will do greater works than these” (John 14:12). The fruit borne by Jesus’ followers is sometimes taken to refer to converts to Christianity. “Greater works than these” would then mean “more converts than I myself made.” For those called to evangelism, this is certainly true. If Jesus is speaking in this passage only to the apostles—appointed as they were to preach the good news—in this passage, then perhaps fruit refers only to converts. But if he is speaking to believers in general, then fruit must refer to the whole range of work to which believers are called. Since the entire world was created through him, “the works that I do” include every imaginable kind of good work. For us to do “greater works” than heretofore seen could mean designing better software, feeding more people, educating wiser students, improving the effectiveness of organizations, increasing customer satisfaction, employing capital more productively, and governing nations more justly. The value of bearing fruit does not lie in whether we work in business, government, health care, education, religion, or any other field. The value lies in whether our work serves people’s needs. “I am giving you these commands so that you may love one another” (John 15:17). Service is the active form of love. Rather than risk reducing John’s passion narrative to a proof-text for work issues, we will address a single verse that is as important for what it does not say as for what it says. “Jesus said, ‘My kingdom is not from this world. If my kingdom were from this world, my servants would be fighting to keep me from being handed over to the Jews. But, as it is, my kingdom is not from here’” (John 18:36). On the positive side, we find here a marvelous summary of the Passion. Jesus is proclaiming that he is indeed a king, but not the sort of king who is liable to be recognized by a wily politico like Pilate. If Jesus must sacrifice himself for the life of the world, he will do so. And he must indeed sacrifice himself, because his kingship, which is both absolute and absolutely self-giving, will inevitably draw a death sentence from the powers that be. But it is equally important to recognize what Jesus is not proclaiming. He is not saying that his kingdom is an ephemeral, internal religious experience that does not impinge on economic, political, or social issues in the real world. As the NRSV, the NIV, and other translations indicate, his kingdom is instead from another realm (John 18:36). His rule—like he himself—originates from heaven. But he has come to earth, and his kingdom is a real kingdom on this earth, more real than even Rome could ever be. His kingdom come to earth has a different set of operating principles. It is powerfully at work within the world, but it does not receive its marching orders from the present rulers of the world. Jesus doesn’t explain at the time what it means for his kingdom to be from another world yet in the world he himself constructed. But he reveals it in vivid terms later, in the vision reported in Revelation 21 and 22 , when the New Jerusalem comes down out of heaven. Jesus’ kingdom descends to take its rightful place as the capital of this world, where all his disciples find their eternal home. Whenever Jesus speaks of eternal life or the kingdom of God, he is referring to the earth we inhabit now, transformed and perfected by the Word and the power of God. The final chapter of John provides an opportunity to reflect not so much on work itself, but on the identity of the worker. The disciples are fishing when they meet Jesus. This is sometimes seen as a bad thing, as if they are fishing when they ought to be preaching the kingdom of God. But there is nothing in the text that suggests disapproval. Rather, Jesus blesses their labor with a miraculous catch. Afterwards, they return to their appointed work as preachers, yet even this reflects only their specific calling and is no slight on fishing as such. However we take the setting, the impetus of the chapter is the restoration of Peter and the contrast of Peter’s future with that of the “disciple whom Jesus loved” (John 21:20). Peter’s threefold affirmation of his love for Jesus restores his relationship with Jesus after his earlier threefold denial. Looking to the future, Peter will endure martyrdom, while it is cryptically hinted that the Beloved Disciple will enjoy a longer life. We will focus our attention on the latter figure, since his self-designation speaks directly to the question of human identity. It is a curious thing that the identity of the Beloved Disciple is never revealed in the Fourth Gospel. Most scholars deduce that he is the Apostle John (though there are some dissenters), but the real question is why he shrouds his name in such secrecy. One answer would be that he wishes to distinguish himself from other disciples. He is specially loved by Jesus. But this would be a strange motive in a Gospel permeated with Christ’s model of humility and self-sacrifice. A far better explanation is that he terms himself the “disciple whom Jesus loved” as a way of representing what is true of all disciples. We are all to find our identity first and foremost in the fact that Jesus loves us. When you ask John who he is, he does not answer by giving his name, his family connections, or his occupation. He responds, “I am someone Jesus loves.” In John’s words, the Beloved Disciple finds himself “leaning on Jesus’ bosom” (John 13:23, KJV), and likewise, the Messiah finds his identity “in the bosom of the Father” (John 1:18, KJV). In the same way, we are to find out who we are, not in what we have done, or in who we know, or in what we have, but in Jesus’ love for us. Yet if Jesus’ love for us—or, we may say, the Father’s love for us through Jesus—is the source of our identity and motivation of our lives, we work out this love in our activity in God’s creation. One crucial aspect of that activity is our daily work. Through God’s grace, work can become an arena where we live out our relationship with God and others through loving service. Our everyday labor, however humble or exalted it may be in others’ estimation, becomes the place where God’s glory is displayed. By God’s grace, as we work, we become living parables of the love and glory of God. D. A. Carson, The Gospel According to John, The Pillar New Testament Commentary (Grand Rapids: Eerdmans, 1991), 68-81. These are the only two occurrences of “bosom,” Gk., kolpos, in John’s Gospel. We have used the King James Version because most modern translations (NASB excepted) miss this parallelism. Adopted by the Theology of Work Project Steering Committee May 13, 2011. © 2011 by the Theology of Work Project, Inc.